I’ve been sharing my love of Flamin’ Hot Cheetos with you all for quite some time now. You guys seem pretty into them and have shown a lot of love for our recipes like the Flamin’ Hot Cheetos Corn and Flamin’ Hot Cheetos Chicken Cheese Sticks. Of all the things we’ve done with Flamin’ Hot Cheetos, we had not yet put them in a drink. Well, that’s about to change. 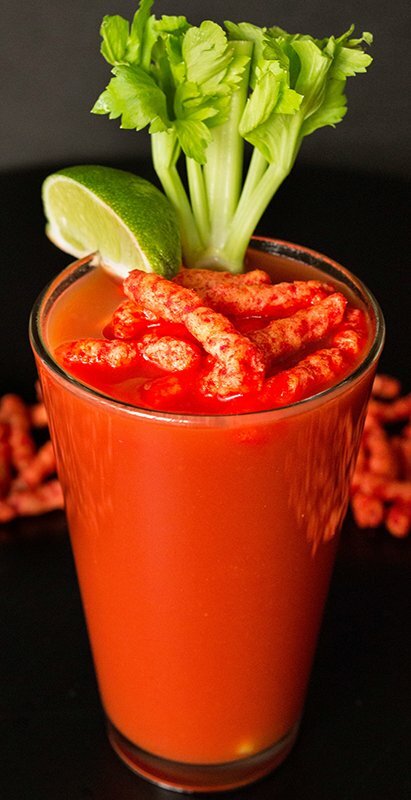 A month or so ago the internet was buzzing about a Flamin’ Hot Cheetos Bloody Mary that was being made by a bar in Orange County. What a wonderful idea! I was immediately intrigued. In my research, however, I became a bit disappointed because they just used regular vodka to make the cocktail. This did not sit right with me. For my version, I wanted to make my own Flamin’ Hot Cheetos Vodka. 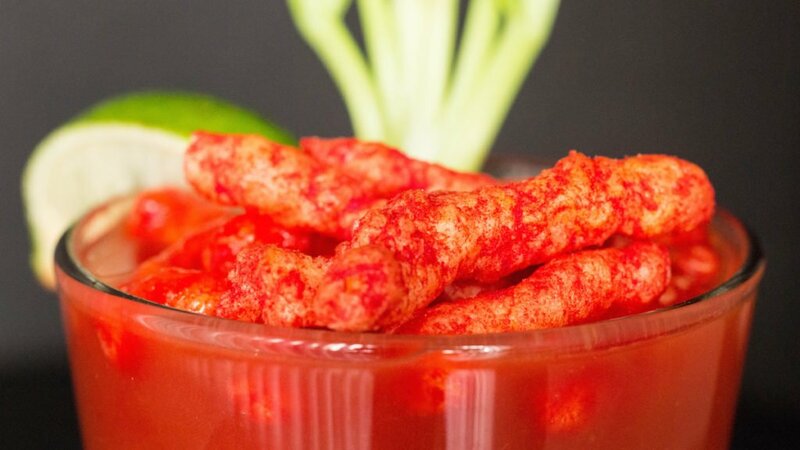 It’s actually very simple to infuse vodka with Flamin’ Hot Cheetos. I filled a 32oz mason jar to the top with the Cheetos then filled it to the top with vodka (from your best plastic bottle, of course). Let that infuse for 6-8 hours, then strain using a fine mesh strainer or cheesecloth and bottle or store in another sealed mason jar. 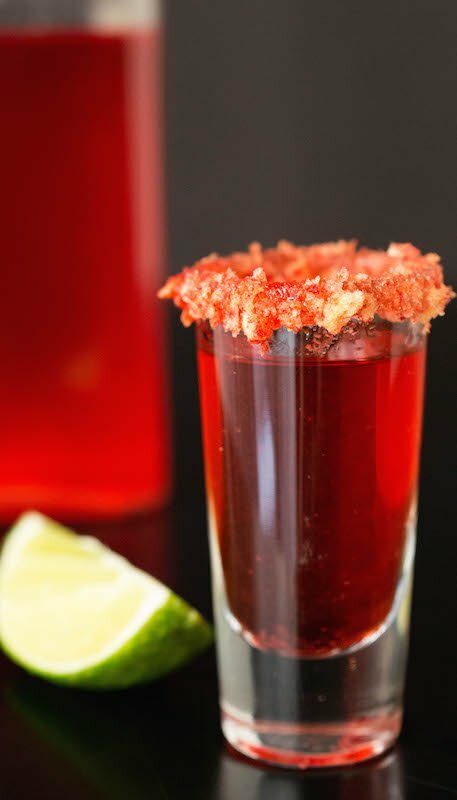 Surprisingly, the vodka really does pack a punch of Flamin’ Hot Cheetos flavor, adds a little extra heat, and pairs perfectly with the tomato juice. I believe this is my new “go-to” brunch drink! I honestly can’t wait to finish writing this post so I can go knock one back while I eat my favorite weekend breakfast sandwich, this Cheddar Waffle BAE. Fill a 32oz mason jar with Flamin’ Hot Cheetos. Pour vodka and fill to the top. Seal and let steep for 6 hours. Strain the vodka using either a fine mesh strainer or cheesecloth. Bottle or jar. 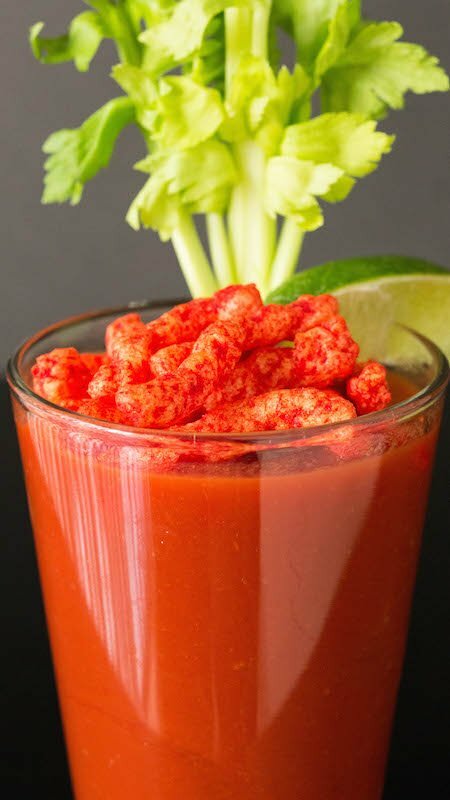 In a bowl or large measuring cup, add the tomato juice, a shot or two of the Flamin’ Hot Cheetos vodka, hot sauce, Worcestershire, salt, and pepper. Stir together to combine. Fill a tall glass with ice then add the bloody mary mixture. Garnish with celery stalk, lime wedge, and additional Flamin’ Hot Cheetos. Irvine, CA. The bar serves a seemingly traditional Bloody Mary that features a sprinkling of Flamin’ Hot Cheetos at the top.